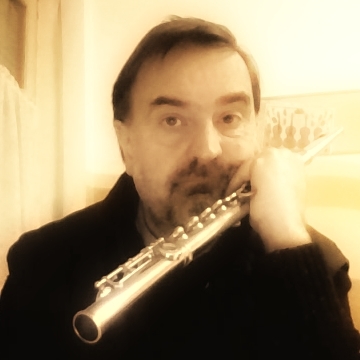 Zitti tutti… ascoltiamo il Sommo: respirazione circolare, flauto nasale, flauto traverso con bordone… e tutto senza perdere minimanente in musicalità. Chapeau! Preferring to lead his own groups, Roland Kirk rarely performed as a sideman, though he did record with arranger Quincy Jones, Roy Haynes and had especially notable stints with Charles Mingus. His playing was generally rooted in soul jazz or hard bop, but Kirk’s knowledge of jazz history allowed him to draw on many elements of the music’s history, from ragtime to swing and free jazz. Kirk also regularly explored classical and pop music. Kirk played and collected a number of musical instruments, mainly various saxophones, clarinets and flutes. His main instruments were a tenor saxophone and two obscure saxophones: the manzello (similar to a soprano sax) and the stritch (a straight alto sax lacking the instrument’s characteristic upturned bell). Kirk modified these instruments himself to accommodate his simultaneous playing technique. He typically appeared on stage with all three horns hanging around his neck, as well as a variety of other instruments, including flutes and whistles, and often kept a gong within reach. Michele Gori è uno flautisti italiani più interessanti sulla scena. Godetevi questa Just Blues! Dal vivo, nèh! Il tanto atteso concerto di Flauti e Misflauti, che doveva tenersi a Torino, al Nuovo Teatro Araldo, il 29 maggio 2017, è stato procastinato a data prossima ventura. Vi toccherà venire al CumianaFest, 16 e 17 settembre 2017, per ascoltare l’ensemble flautistico suonare in concerto insieme alle ballerine della ASD Jazz Dance. Da non perdere!